Chelsea Manning celebrates her 27th birthday today, behind bars in a US prison. She is a whistleblower, human rights defender and political prisoner who has been sentenced to 35 years in jail for releasing classified US documents to Wikileaks. These documents revealed war crimes and cover ups by the US military in Iraq and Afghanistan and the contradictions between Washington’s public and private policies. A heroic trans woman, Chelsea followed her conscience – motivated by altruism and idealism. “Chelsea Manning is a defender of democracy and human rights. Her actions are based on the principle that citizens have a right to know what the government is doing in their name,” said Peter Tatchell, Director of the human rights organisation, the Peter Tatchell Foundation, which has supported Chelsea’s defence campaign on human rights grounds. “Manning is a true patriot, not a traitor. She reveres the founding ideals of the US – an open, honest government accountable to the people, pursuing its policies by lawful means that respect human rights. At great personal risk, she sought to expose grave crimes that were perpetrated and then hidden by the US government and military. These are the characteristics of a person of good conscience. Any concern regarding the release of some documents is far outweighed by the overall positive good. Thanks to Manning, we, the people, know the truth. She deserves a presidential pardon. “Chelsea should not be in prison. Instead, put on trial those who killed innocent civilians and those who protected the perpetrators,” said Mr Tatchell. 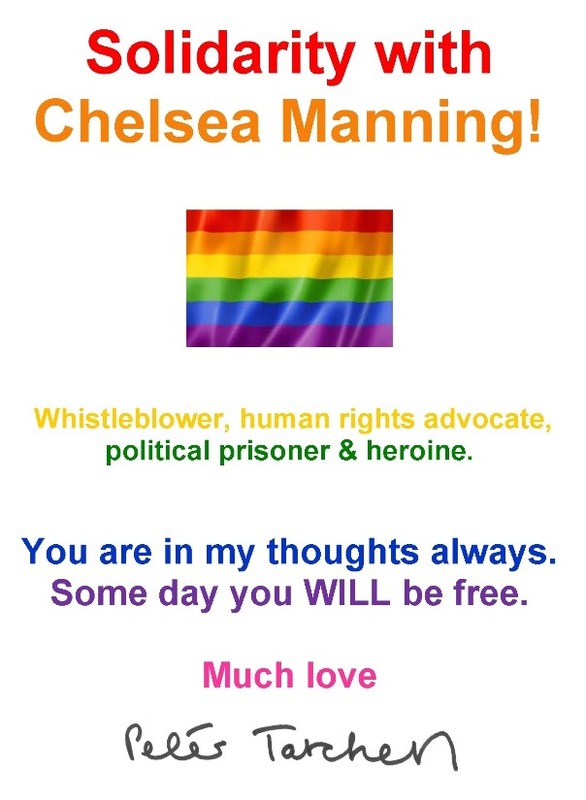 Bradley Manning, Chelsea Manning, Manning, Peter Tatchell, Peter Tatchell Foundation, political prisoner, Trans, whistleblower.